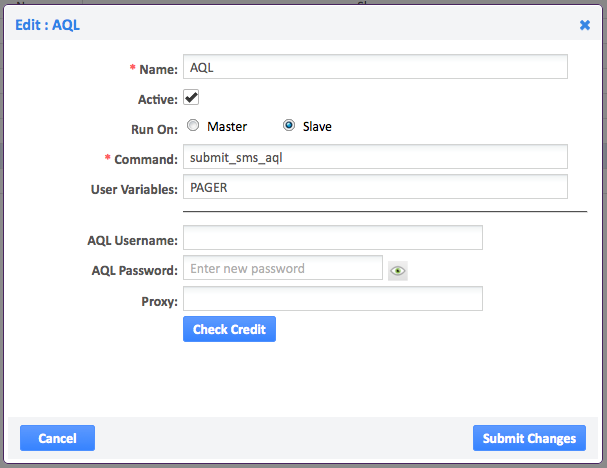 AQL provide a simple way of transmitting SMS alerts from Opsview. This service works from most countries; all you need is an AQL account. Sign up for prepaid credits at aql.com with the code 'opsera-1234' to receive discounted rates and 50 free credits. AQL Username: This is the Username for the AQL system. Click on Check Credit to see how many credits you still have from AQL. AQL Password: This is your AQL password. These servers are used in a round-robin fashion, so your firewall must allow connection to each one.